So I noticed, years after Arma 3 has been out, there are still very few mods for an F-35B, and none are standalone. Aegis: probably the best one, but its not standalone. Furthermore I wanted to make additional changes, but I am not in anyway trashing this one. So at the moment, I've got a standalone VTOL F-35 with a working targeting camera, sensors suite+stealth properties, dynamic loadout system, and animations working. Hitpoints to allow subsystems to be damaged are partially implemented. I will try to make the textures look better soon (it is way too bright under mid day direct sunlight). I'm trying to give it a more versatile weapon's loadout, so that it won't just be limited to a pair of bombs (or SDB racks) and a pair of AMRAAMs. To this end, I've made a 4x Scalpel rack for internal carriage, a 2x AMRAAM rack for internal carriage, and a new type of anti-radiation missile for internal carriage. It also has 2 weapon pylons on the doors that rotate outward when fired (similar to the Blackfoot's pylons), so that it can plausibly employ direct DAR and DAGR rockets. The new missile I'm dubbing the AGM-99 ALARM (Advanced Light Anti-Radiation Missile. It's significantly weaker than the HARM (in terms of damage from a direct hit, as well as indirect blast damage and radius), it takes 3 hits to destroy a Zsu-39 Tigris, but it will take out the static SAM radars and the Nyx Radar variant in 1 hit. I had thought about giving it a 25mm internal gun (files for such are in game, but not well balanced- however for a space and weight limited V/STOL model, a smaller 20mm cannon makes more sense. Also since it can fire 70mm rockets for use in CAS, a heavier hitting cannon isn't needed so much for taking out armored targets. Its getting the same 20mm cannon as the blackfoot (which should be a 3 barrel version of the good old M61 Vulcan, "the world's lightest 20 mm Gatling cannon") with 300 rounds. I've also added a new missile type, a smaller version of the HARM, the AGM-99 ALARM (Advanced Light Anti-Radiation Missile. I'm going to try and tweak its blast so that 1 is not sufficient to take out a Tigris/Cheetah, but it will kill static radars and Nxy recons (Currently its direct and indirect hit damage is 1/3 of the HARM's, and its indirect hit range is just above 1/3... haven't tested if this will knock out a Cheetah/Tigris, or if a 2nd missile is needed yet). *I'm considering removing the 2x ALARM racks, and the 1x ALARM option from the outer pylons, so that it can only carry 2x ALARM, as opposed to up to 6 currently. Top speed is the same as the Black Wasp for now (I think I'll scale it back a little). Radar stealth and range is the same as the black wasp. Its IR stealth is a 20% reduction in detection range (a 0.8 multiplier). Its IR sensor is the same as that found on the A-164 wipeout, except not limited to view distance settings (I don't know why they do that for vanilla assets ). After the C-model of the F-35 was unexpectedly the most troublesome, the Navy withdrew from the F-35 program to focus on development of the Black Wasp, starting from old designs of a navalized Raptor. Many regretted that the JSF design was "inherently compromised" due to concessions to the STOVL variant, and wished it had simple been an update to the F-22 with a carrier variant. Previous experience showed that a joint Air-Force and Navy fighter could work well, as with the F-4 Phantom, and many felt the STOVL variant in addition to this was too ambitious. None-the-less, the F-35B was a massive upgrade to the old Harrier for the Marines and NATO partners lacking full size carriers. The Air force and Marines, in cooperation with NATO partnersm pressed ahead with an update to the F-35. The F-35 D (CTOL) and F-35E (STOVL) featured reduced weight and improved range in part thanks to improved materials and engine efficiency. Once criticized for its expense and waste, the overall program became much more efficient due to a variety of factors. The declining western economies drove down labor prices, resulting in cheaper jets. CSAT began to be considered an existential threat to the western nations, and politicians began to be more concerned with efficiency than pork barrel projects. Even more importantly, CSAT's favoritism towards state owned or linked companies resulted in many multi-national companies beginning to show more loyalty to the countries that were nominally their homes. Embezzlement and overcharging decreased, and the F-35 upgrade program actually began to proceed quickly and at a reasonable price. The increased threat of anti-ship, anti-runway ballistic missiles, and high speed cruise missiles created renewed interest in the V/STOL variant. The Navy wished to be able to distribute its airpower to smaller ships such that the loss of a carrier wouldn't be so strategically catastrophic; while the Air force desired the ability to set up multiple forward bases, to have multiple rebasing options in the event of an incoming missile strike that is not successfully intercepted. The three services came together to collaborate on another version, that would be used across all services as a true Joint-Service strike fighter. The definitive F-35F STOVL fighter was born. The availability of small guided munitions obviated the need for a larger caliber gun, and a lightweight 3 barrel 20mm gatling cannon was installed instead. The VTOL system's reliability had been dramatically improved, with a large increase in time between maintenance/overhaul. The weapon bay dimensions were optimized in light of the new racks and small size munitions, and stealth was somewhat improved, keeping an edge over Eastern stealth designs and AESA air defense radars. of course I'll do "what makes [me] happy", but if there's no interest, then I there's little purpose to status updates in a thread and workshop uploads. That said... I think there would be some interest in some of the things I proposed, based on some "likes" i got in a suggestions thread I made a while back. Basically I complained about Opfor being a bit OP in a scenario with both sides on the same landmass (and both controlling an airstrip, or neither controlling an airstrip)... but that the situation completel reverses if Opfor needs to cross water/do an airborne assault/ only has an offshore based for fast-mover airpower (ie the Xian). Blufor has airmobile armor... Opfor has only MRAPs. Making the Marid's firepower (and an Ifrit's) more competitive with an autocannon (through the use of APDS rounds) would be a good start, and allowing a taru to lift it would be great. Their fast-mover airpower is limited to the Xian if they don't control an airfield (such as a scenario starting with an offshore base), while Blufor can have the offshore base be in the form of the USS Freedom, and it can thus operate black wasps (although with appropriate scripting and papering over the US flag with CSAT flags, CSAT can also operate fast movers from it... but.... its not great). But the Xian is not great at all for A2A combat, even with scripts setting A2A missiles on the pylons (due to its very limited radar range).... so a pure combat variant with better A2A capabilities would be nice. I figured the F-35 would be the greatest challenge, so I'd do that first as a standalone, and if I manage it, put out the little pack afterward (which would be mostly just config changes). Although I still would want to go farther (harrier for the AAF, airmobile static ported ZSU-23s, ural ZSU-23's for syndicat, and a AH-64 port for blufor), I don't think I have time for porting the rest of those. I'm interested mate would love to have this plane in game. To be honest I gave up on USAF mod it seems it will take at a year before a new update , been waiting sinced 2015 .. So your work will be more than welcome. I think I already found how, just haven't had the time to implement it. Any chance you'd be willing to share the tweaked Atlas LHD files? I don't know why it starts to pitch up when you reduce vectoring a little, anyone know what parameter I should change? Well I don't have permission, I downloaded Atlas:LHD Plus... its quite outdate, but it works (you just need to do some text editing of a mission file to place it in, after that copy and paste is fine). But I don''t have the files to rebinarize it and sign the output file. I think a simple config to load after the atlas LHD would fix the pylon problem... but I don't know how else to get rid of the annoying simulation in the map editor after its been placed (the direct editing of the binary file is quite a crude method). Its unsigned, so I don't think it can be used in MP. To the community, I shouldn't upload this LHD thing, right? Ok...sorry you are impatient and we have lives and stuff that comes up. Sorry we’re not androids that work on mods 24/7. Yes, I had already seen these, and they are what I'm using at the moment. The problem for the "openBayWhenWeaponSelected" is that it doesn't discriminate between weapons. Ideally I would like the bays to open when rocket pods are selected (I plan on including the memory point with the hatch selection, so the rocket pods should swing out with the hatch doors), since a delay in firing those is fairly undesirable. For guided weapons like scalpels and AMRAAMs, I would like the bays to stay closed when the weapon is selected, and just have the bays open and eject out of the bottom when one pulls the trigger. I'm unsure what will happen if I do a 6x AMRAAM loadout (2 pylons with 1x AMRAAM each, 2 pylons with 2x AMRAAM each), with 2 of the pylons assigned to bays that open when the weapon is selected, and 2 where the bay stays closed (particularly as I may have two defined bays use the same doors, where the outer pylons just open the outer hatch doors, while the inner pylons open inner and outer hatch doors). So... I think I may want "openBayWhenWeaponSelected" to be set to zero, and a separate script to animate the doors when DARs or DAGRs are selected. In September 2016, Orbital ATK unveiled its extended-range AARGM-ER, which incorporates a redesigned control section and 11.5 in (290 mm)-diameter rocket motor for twice the range and internal carriage on the Lockheed Martin F-35 Lightning II. The U.S. Navy awarded Orbital ATK an contract for AARGM-ER development in January 2018. So... at the moment, I have a working HUD, animated VTOL/control surfaces/weapon bays, working pylon loadout (still needs a picture for the F-35 instead of the buzzard in the pylon loadout menu), sensors and stealth. I still need to get an animation working for the stick in the cockpit, and do something it improve the textures. I also still need to improve the 2x AMRAAM pylon so that 2 AMRAAMs are actually visible. I also need to add memory points for wingtip vortices. I've updated the mod... I was trying to do some more complexstuff with the weapon bay animations, but something "funny" was going on; so (for now) all weapon bay doors open when weapons are fired, regardless of which bay the weapon is stored. I made the outer pylons swing out with the doors, but they actually don't shoot straight that way (the bays don't swing perfectly in line). Therefore I will be updating this again with the outer weapon pylons not rotating with the weapon bay door, but instead using a translate animation to just drop them down as the bay opens without changing their orientation (the difference shouldn't be very noticeable). I've started to configure hitpoints to allow subsystems to be damaged... but it still WIP. So its pretty playable/usable right now... for now I'm also including a full combat variant of the Xian... to separate later (and include into a small pack along with the F-35 and an airmobile Marid firing 12.7x108mm APDS rounds). I had the pilot stick animated, but it was really funky... so its not animated for now. The outer pylon animations are fixed so that the rockets shoot straight. 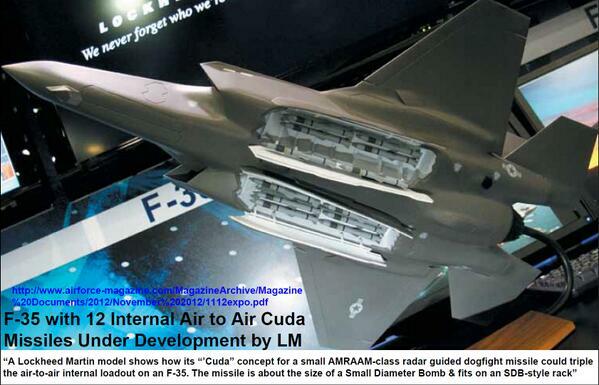 The 2x AMRAAM and 2x ALARM pylon models are in place... I didn't realize zephyrs were significantly bigger than AMRAAMs, so those clip a little. I also tested the ALARMs. A Tigris survived 2x ALARM hits in 2 out of 2 tests. A 3rd ALARM hit destroyed it. That should give the Tigris a warning, and allow it to switch off radar, pop smokes, move, etc. It takes half the capacity of the F-35 to down 1 Tigris using ALARMs... so I think its balanced out (Nyx and static radars were still 1 shot kills). I will take a look during the weekend so i can help you with the sticks animations. I think I can help you too with the dorsal air intake shape. While I was at it, I changed the lift fan intake to open like the F-35B does (and not like the X-35). Will update soon, I realized I didn''t have the addon builder set to include the .rvmat files... which should solve some of the error messages but now I get messages asking for some picture associated with the 2x AMRAAM racks... I don't know why they even need a picture, and I never put anything in the addon to point to a picture... must be some inheritance thing. So on a bit of a tangential note... is anyone interested in a dedicated Air combat variant of the Xian to serve as a CSAT counterpart? I've made one with no cargo capacity, a wide-view-angle radar with a 16km range (and 5km air range IR sensors), 10% boosted top speed, pitch, roll, and yaw rates. So a full A2A loadout could carry 12 AAMs, and it can still carry 9 AAMs while carrying an ARM missile. Additionally, It holds 300 countermeasures, instead of its previous amount. And to further increase CSAT's ability to mount an offshore assault from a small island/platform, I've made a slingloadable Marid variant... It still won't stand up to a Marshal or Rhino (which nato can deploy with air assets), but its better than an Ifrit. To make it slightly less outclassed, I gave it a 12.7x108mm HMG (which is already slightly more powerful: comparte the T-100's NSV-T to the standard HMG) that can also fire APDS rounds (ie, the same as fired from the Gm6 Lynx rifle). It can effect a firepower kill on a Marshal in a reasonable amount of time with its HMG. As a further enhancement, I gave it "Sabot grenades"... the concept being that a smaller grenade (in a lightweight sabot) could be launched at a higher velocity from the 40mm GMG. So the sabot grenades have twice the muzzle velocity of the standard 40mm grenades (482 m/s instead of 241 m/s) , which increases the effective range of the GMG/ make it act more like an autocannon firing HE rounds. The downside, of course, is that they have a weaker explosion. every error message I get rid of causes new ones to show up... now its asking for textures and .p3ds that I swear have nothing to do with the mod... I don't know what I've got in there that is making the game ask for those. I've nerfed its internal ARM load a little, it can only carry 2x ALARMs in place of the previous 6. It can now only go on the pylons that hold 2x amraam/bombs. Updated again, the error messages are gone! I think I made it a bit too dark now, still have some Hud things to improve (I don't really like those dials... I'd like to have a PiP of the targeting camera there). I tweaked the textures again... maybe its too dark now? Also, I think I'll make a Tanoan variant soon. Re: the external- and internal-only variants, you're still using the same airframe model (P3D) right? First I want the Stealth VTOL variant to be of a reasonable quality before messing with that. So I just realize I was always testing with the P: drive mounted, and my files contained paths to the textures in the P drive. Are you still around? It has gone quiet about this project for over a month.